A bride’s bouquet is something very special. It’s as individual as she is and reflects her personal style and tastes. It’s also an integral part of the wedding day. Like the dress, the ceremony and the meal, the bouquet is a crucial part of the entire process. That said, there’s no reason why you have to stick with convention and go with traditional flowers. 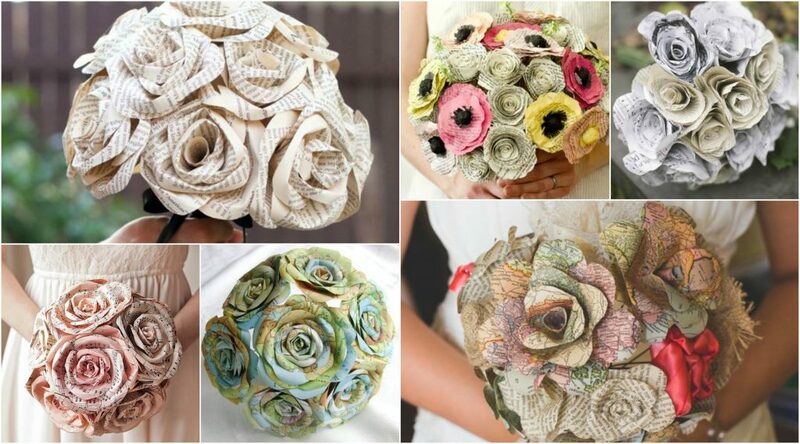 Indeed, today brides are choosing some stunning, fun and creative alternatives for their bouquets. Bear in mind that many elements of these alternatives can also be fused with real florals for a truly unique look. Apart from allowing you to show off your personality a little more, alternative bouquets, tend to make fantastic keepsakes that you might even pass on to the next generation one day. If you’d like to chat about this or any other aspect of your wedding day plans, then don’t hesitate to get in touch with me directly. One of the biggest trends in recent times is for brooch bouquets. These are bouquets made entirely of stunning brooches and jewels all cobbled together into the shape of a bouquet. You can make this a personal as you wish by incorporating keepsakes from your loved one. Buttons are another beautiful idea and can work well alongside the brooches. Either way, they make for a stunning keepsake after the wedding day. Be it sheet music from your favourite song as a couple, passages of books, pom poms made out of vibrant crepe, origami or a paper map of the world. 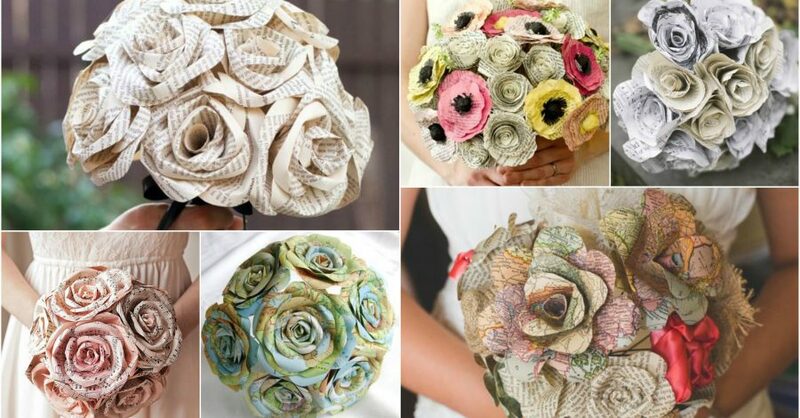 Paper bouquets give you huge scope to be creative. Plus they are very economical compared to fresh flowers and again will last as a keepsake after the day. Burlap and lace are a match made in heaven and if you’re going for a vintage chic sort of look, then this really is a wonderful alternative to fresh flowers. Especially if you’re got a crafty streak or indeed a relative is a dab hand with a sewing machine. It will make the bouquets even more special. Make a total style statement with some flashy feathers and stunning shells for your bouquet. These two can go together, but often look best as either one or the other. 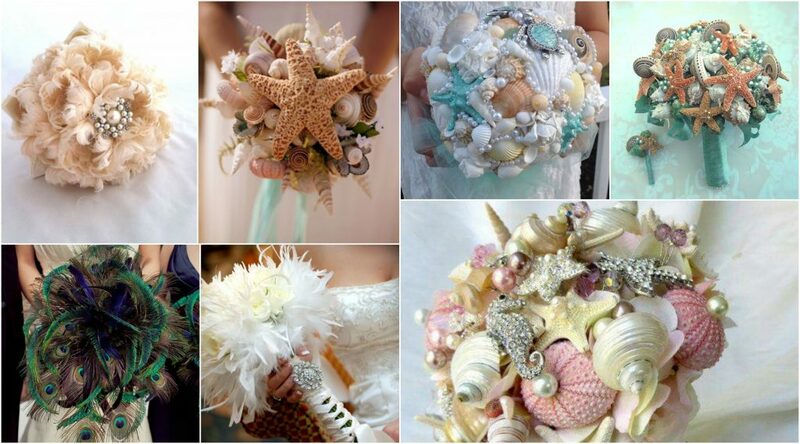 If you’re having a bit of a marine theme or are a total water goddess, then shells will look truly fantastic for your bouquet. 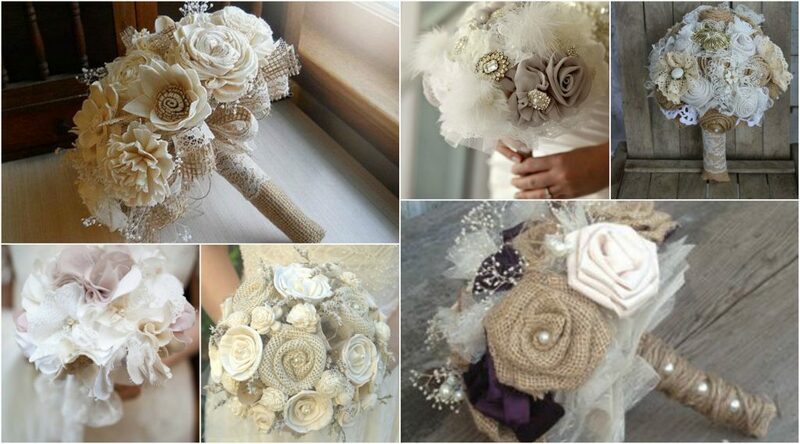 Feathers can also be a great addition to a floral bouquet or go all out with an entire bouquet made of feathers too. 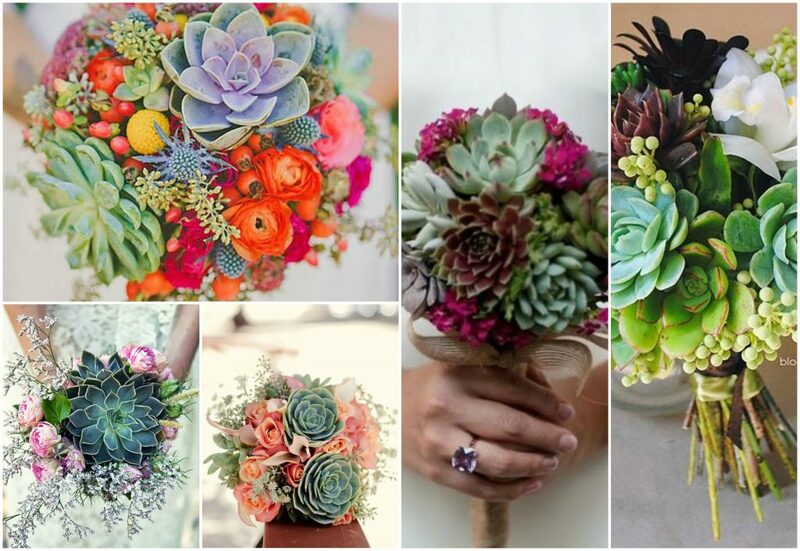 If you’re a bit of a botanic aficionado, then why not go for a bouquet of succulents? Try some exotic cacti with unusual colours and shapes and intersperse with regular blooms and green leaves.